Hull Royal Infirmary has opened a £7,000 cinema showing footage of Yorkshire throughout the decades to help patients with memory problems. The film booth – complete with cinema seats and a giant screen – has been set up in the middle of Ward 80 to help people reminisce about their past and share memories of growing up in the city. Dr Yoghini Nagandran, Clinical Lead in the Department of Elderly Medicine, said: “Coming into hospital can be quite a frightening experience for anyone, especially for people with memory problems including dementia. “We can now show old films which can bring back memories for people and be a starting point of a conversation. “We had two patients the other day who were complete strangers but watched the films together, enjoyed a chat over a coffee and some biscuits and became friends. Ward 80 is the Progression to Discharge Unit where patients recovering from recent illness spend time recuperating before they are discharged home with support or to a care home. The cinema helps to keep people mobile, encouraging them to move around the ward to prevent muscle wastage and get back into a more normal routine following a hospital stay. The booth has been designed in the style of an old cinema with film posters advertising classics like Gone With The Wind and Casablanca on the outside. Footage from the Yorkshire Film Archive shows street scenes and images from rugby matches and sporting events from the 1950s and 60s. WISHH, the independent charity supporting Hull’s hospitals, was able to fund the £7,000 cost of the cinema thanks to the generosity of its supporters and members of the public. Susan Lockwood, chair of the board of trustees at WISHH, said: “The cinema is a fantastic addition to the ward and will enhance the care patients already receive from staff. Families visiting elderly relatives on the ward can use the booth to make easy conversation. Dr Dan Harman, Consultant in Elderly Medicine, said: “Our primary concern is to make sure people are safe and we deliver the high-quality care they need. “However, if we can do that in an environment that’s more homely for elderly patients or those who are frail, that can make a huge difference. 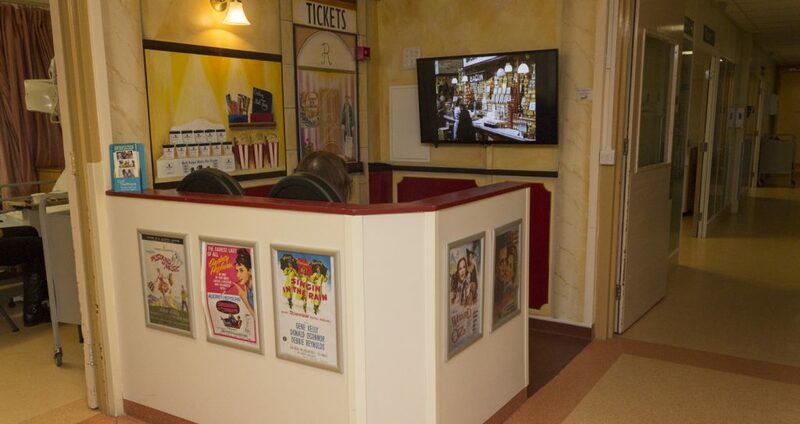 Be the first to comment on "Hospital ward opens cinema for patients with memory problems"